Cebek I-91 is an electronic traffic light simulator. 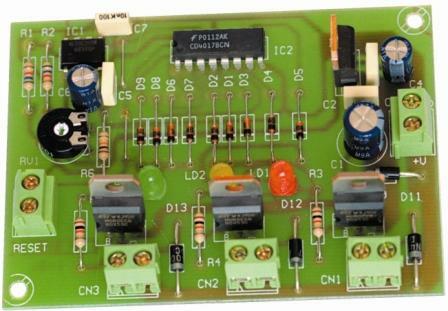 It allows the natural operating of a traffic light, connecting sequentially the outputs corresponding to the green, orange and red lights. It offer the possibility to adjust the time between 5 and 50 seconds. For the GREEN and RED output; the ORANGE output will be always ¼ of the determined time of the other colours.